To help make appointment scheduling simpler and more efficient for you, your staff and your customers, we’re introducing improved Appointment calendar widget that enable customers to book repair appointments through your website. Business owners can now define device color, type of services (pick up, mail in, walk in, onsite repair), appointment interval & set business hours. Customers can view available time slots and book appointments within a few clicks. It’s simple, effective, intuitive and quick. Get instant email and SMS reminders for every appointment you book, Say goodbye to missed appointments! The web page looks great on both larger screens and mobile devices. Check steps on how-to to get up and running with appointment calendar. 1. Head to Setting >> Integrations >> Appointment Calendar Widget. You will be taken to the Introduction page of Appointment Calendar Widget. 2. Click on Generate iFrame Code button to receive iFrame code. 3. The pop up screen will show you the iFrame Code . You can use the iFrame Code for multiple store locations as well. 5. Copy and & paste iFrame code inside source tab of WYSIWYG editor on your website. 6. Once you've successfully configured appointment calendar widget on your website, customer can select device, service, view available time slots and book appointment within a few clicks. 7. Check out Design Example tab to see how the widget will display over your website. 9. You can either enable Time Window or Time Slot. These timings would be available for customer appointments. 10. Click on Add Break to consider working breaks each day. These timings would not be available for customer appointments. Select start, end or available time window from appointments for each day. 11. Decide Appointment Interval from the drop-down menu. 13. Under Advance Configuration you can customize or translate success messages. 14. Want to schedule time for business closures, time off and vacations? Set unavailable slots from Holidays tab. 15. Click on Unavailable button. Enter duration and notes for unavailable slot and hit Save. 16. Once the appointment is scheduled and confirmed, customer and admin will be notified via Email / SMS. 17. 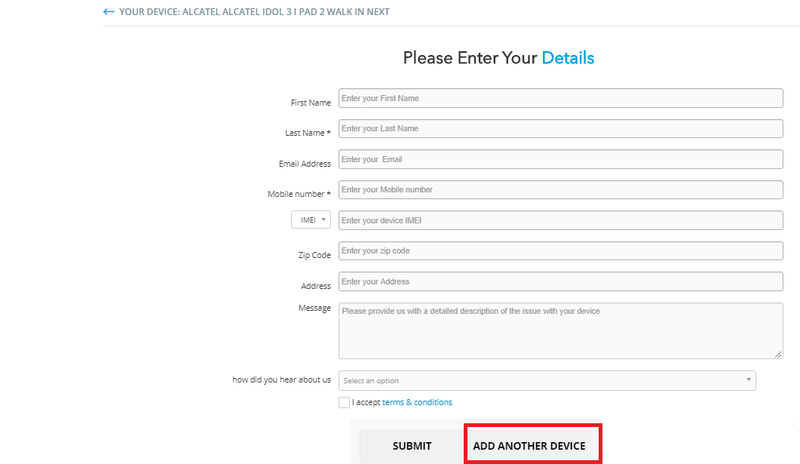 While making a lead from appointment calendar we can add multiple devices through widgets. the same procedure will be followed for adding a device. 18. Leads generated through appointment calendar are available under repairs >> manage leads. 19. At any point If you would like to convert lead to a repair ticket simply click on status label and mark it as WON. Q. Where can I view leads generated via Appointment Calendar Widget? A. Whenever a customer books a repair via Appointment Calendar Widget, you will receive a notification on RepairDesk. You can view them in the Manage Leads section. To know more about Manage Leads section, check out this article. Q. How can I translate widget in other language? A. If you would like to translate appointment calendar widget in your primary language, please head to setting >> integrations >> language editor and click Edit. Now click on appointment calendar widget, edit translation and once you are done hit Save All. Q. How can I add device color? A. We have recently added a functionality that allow you to add color selection against each device. To set it up please head to inventory >> manage inventory >> manage services >> repairs & click on view all devices under action. Now click on update under action against any device and add color from next screen. Q. Which languages are supported by RepairDesk? A. As of now, RepairDesk supports 20 languages. To know more about Language Editor and translate sections into your desired language, please click here. Q. Can i display price excluding tax? 3. Open Appointment Calendar Widget. 4. Under Configurations tab, activate trigger for "Display Price Without Tax"
Now when a lead selects a repair, its price will show without tax. 2. Head towards Email Notifications. 5. Explicitly mention that this is the price without tax. Now when lead will book a repair appointment or receives an email, it will be visible price is exclusive of tax. Q. How can I create an estimate? A. To know how to create an estimate, please click here. Q. How can I track my leads in Google Analytics via Appointment Calendar Widget? A. Curious to know how you can track your leads coming from Appointment Calendar Widget in Google Analytics? It's quite simple. Let us show you how. 1. Setup Google Analytics on your website. 2. Open Appointment Calendar Widget. Head to Advanced Configuration, click on Source and Paste your Google Analytics Tracking Code in the mentioned space in the attached screenshot. 4. Now go to Google Analytics >> Behavior >> Site Content >> All Pages. Copy the Thanks page URL of your website and paste it in the search bar. 5. Select Secondary Dimension >> Acquisition >> Source/ Medium. Here you can see if the lead source is organic, paid, social or referral etc. Q.How triggers work in appointment calendar configuration? Enabling this trigger will allow you to select color of the device/item, which user has associated with while making item. Disabling this trigger will remove the option to select color for device. Enabling this trigger will allow the option of on site price for the appointment . This trigger allows to app pick price for device if user select pick up device option. Enabling this trigger will allow user to select while making lead that either its a simple repair or warranty repair. this is just task type and it has nothing to do with warranty module in repair desk. 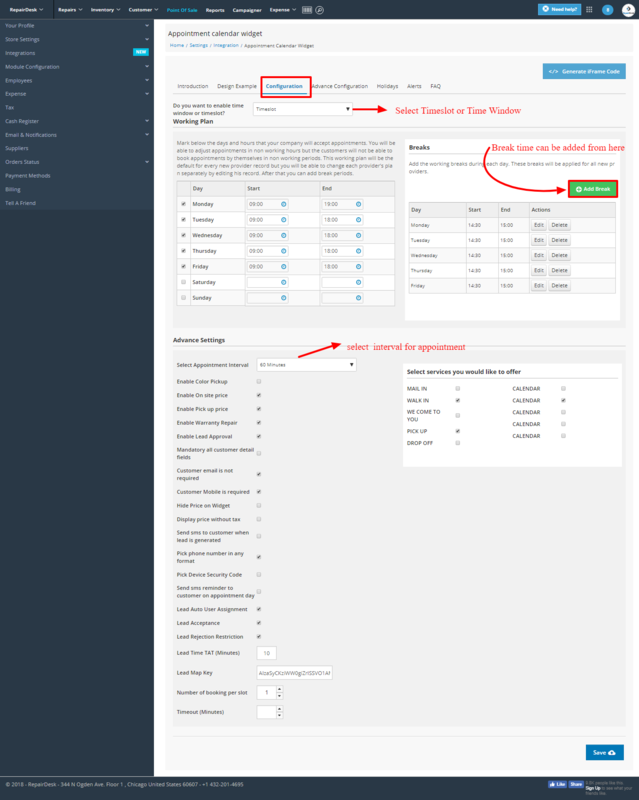 Enabling thi trigger will allow user to approve or close lead generated fron appointment calendar. Enabling this will restrict user to fill all the data in the fields regarding their detail. If the above trigger is disabled only then-current trigger will work. Enabling this trigger will hide price from appointment widget. Enabling this trigger will display price without tax on the appointment widget. Enabling this trigger will allow to system to send sms to customer once lead is generated. This trigger allow adding security code for the device. This trigger allows system to send sms to the customer on appointment day in order to remind them.